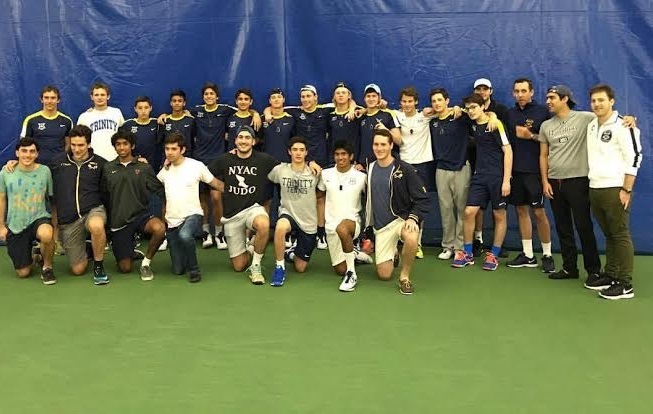 The banner season for the Trinity boys’ tennis team continued on Sunday afternoon as it defeated Horace Mann 5-0 in the Mayor’s Cup team final at the Stadium Tennis Center. The event was hosted by Cary Leeds Center for Tennis and Learning, but due to rain, the final was moved indoors to Stadium Tennis Center. The win caps off another fantastic season for the Tigers, who also captured the San Marco Invitational championship back in May. The Tigers were led by its captains, Ananth Raghavan and Alex Chao, who both won their respective singles’ matches. Chao saved three match points, and came back to win his match in a third set tiebreaker. "From the outset, winning the Mayor's Cup was our chief goal this season. In fact, it's been our goal for several years now," said Trinity head coach Damon Lopez-O'Dwyer. "We came very close in each of the past three years, so to finally get over the top is a terrific feeling. This team has worked hard not just this spring, but for several years. We've enjoyed a huge amount of success over the past five seasons and have appreciated every bit of it, but this felt like the final piece we needed." The win was a fitting end to the careers of captains Ananth Raghavan and Alex Chao as well as fellow senior Antony Jippov. "Together, they had done everything they could do in their high school tennis careers, except this, so I'm especially happy for them," added Lopez-O'Dwyer. "It's a fitting end to their terrific run together." The win marks the first Mayor's Cup title for Trinity since 2000. Over the past five years, Trinity has won two San Marco Tournament titles, four Ivy League titles and posted a 62-4 record in Ivy League play. "The defining quality of the teams we've had over this era is that more than anything else, they've loved being a team," said Lopez-O'Dwyer. "They play hard for each other every day. The fact that we had so many alumni players and parents cheering us on is a testament to the community around this team. It's a very special thing and something I hope the guys will carry with them for a long time."